Yesterday I released them in a pack with a discount coupon worth of 10%. I am glad to announced I have added 2 more themes into our Xenforo2 Super Pack collection. 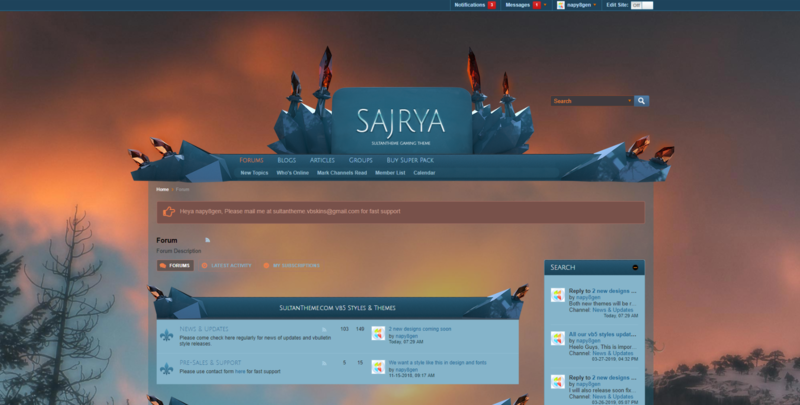 Our vb5 themes, Bad Dragon, Bad Dragon2 and Saga-X(red version) updated because of the font for button too small size. Super Pack zip also updated. Thank you for waiting. I have updated all our vb5 styles with the latest vb5.5.0. You can login and re-download now. You now can re-download your style. The system automatically merged without problem. 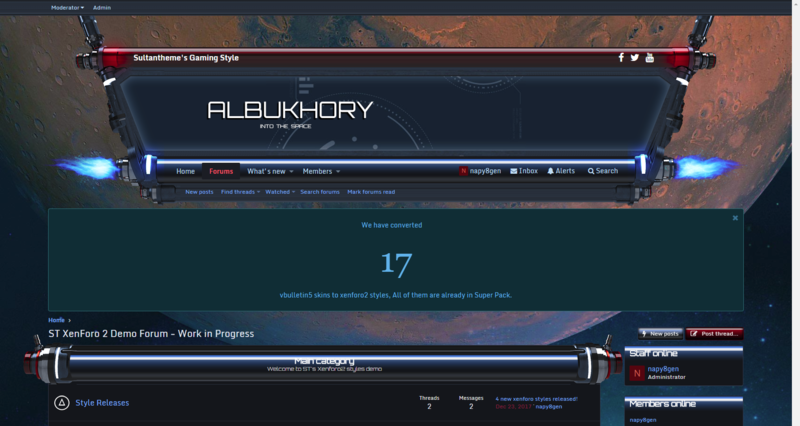 So if you are upgrading your forum, you do not need to do anything if you found all is successfully merged. ST vB3 Responsive Updated Again!! 1) I fixed the logout link drop when logged in in iphone6 plus. 2) I fixed the moderator column to have a width so it balanced out the rest. 3) I fixed safari 5 desktop logo being so small. Today I have updated all the 12 Pro Pack Dark Styles with below fixes. All zips updated. The original Pro Pack contained all dark styles and light styles. And I added new deleted topic icon and closed topic icon. Both Pro Pack light and dark themes series has been updated. 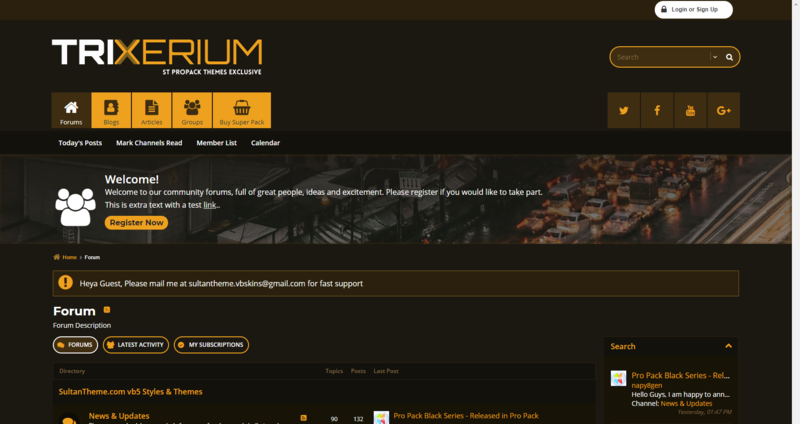 1) Fix propack Trixerium black series – fix subforum icons colors in sub forum page -forum listing and subforum icons cutoff in firefox. Trixerium Cocoablack login arrow. 3) Fix propack Trixerium light series – top menu drop down arrow color when inactive. Or you want all the Pro Pack including the original light styles. 4 Pro Pack Dark styles now available individually in the store. You can now grab any of 4 Pro Pack Dark Styles. If you want to buy in a bundle, all included in the Pro Pack. Here are the shop links. Now I released again my vb5 Pro Pack series update. You can redownload now. 2. Fix double collapse arrow in sitebuilder pages. There are multiple updates for Arabic again. 2. The search drop down arrow position in Arabic is now fixed in all styles. 5. 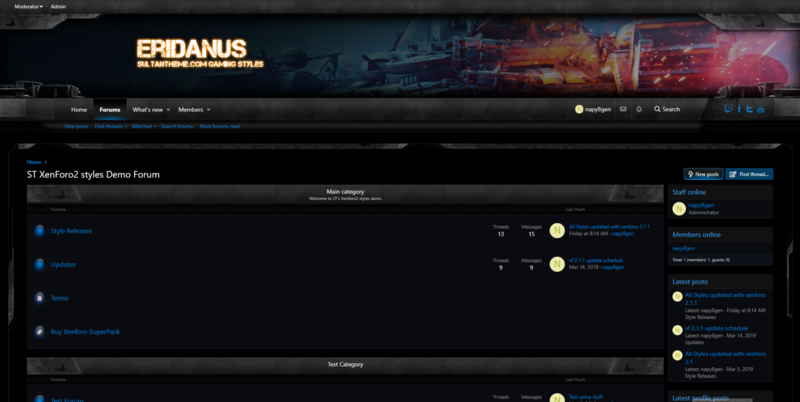 For some styles the subforum bg is transparent. This is now fixed. I have fix numerous issues with Arabic especially XDerium. Thank you For Brother Abdul Rahman for reporting. You can now re-download the zip. 1. Arabic and non Arabic subforum folder icons spacing bug. 3. XDerium forumhome icons overlaps in subforum list. 4. XDerium postbit bottom slant triangle design off position in Arabic. Both xenforo versions have been updated with the latest xenforo 1.5.22 and xenforo 2.010. I have also released Merhania and Redxodus for xenforo 2. Now we have 26 altogether in the xenforo2 Super Pack. I have also fixed some earlier display bugs in conversation messages and profile messages. Actinium updated to fix broken footer after being updated last time (vb5.4.3). Our old shop is now closed due to oudated coding when I have decided to upgrade all demo forums with PHP7 upgrade. This is because vBulletin will no longer support PHP5. For old customers that still downloading style updates. Please email me using our site contact form your email used to purchase the style. Paypal has record from year 2015 until now but any of you that purchased from us way back 2008-2014. You need to provide email receipt from the old shop. And please note that all 3.8.7 and 4.2.2 styles already discontinued and not supported. My download page is using download monitor plugin, this plugin previously display categories and list using special shortcode. But now it cannot display unless you pay yearly. So it has long broken. I managed to get the full list. You can download below and use the style xml provided in the zip to upload into the latest update of vb3 – vb3.8.11 and vb4.2.5 but you must use the ignore style version option. The versions since then just the security nothing in template changes. All vb5 and xenforo styles updated to the latest version. Now our vb3 responsive fully support Arabic. Most changes is within Page Container template, some 2-3 styles with footer template. For Xf1.5.20 update will be ready next week. You can now redownload your styles. In many occasion We saw 2 template changes: header and display topic. I also fixed the top bar border suddenly appears in this versions. And put in 4 more svg icons missing from last version, the search icons, the fb icon and the alert error icon. All our xenforo styles have been updated with xenforo 2.0.4. We saw 2 templates outdated, page container and post macros. If you are current customer, you can do the merge in the outdated notice. That merge system is very good. It will maintained my custom codes and put in new codes. Hello Guys, Our legacy xenforo 1.5.x super pack updated with xenforo 1.5.17. 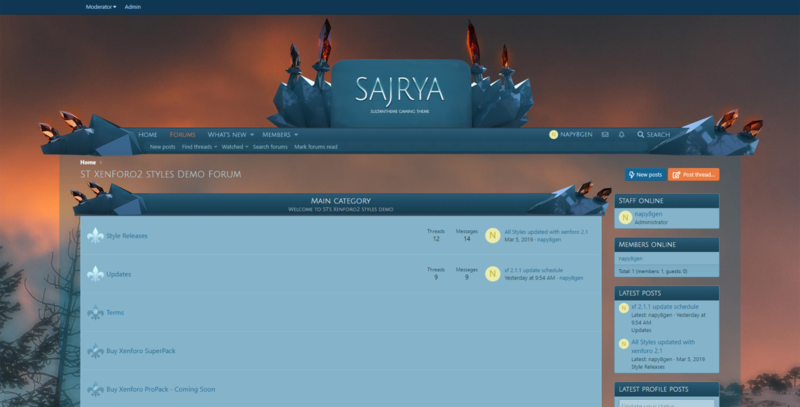 There are no outdated templates, you can safely upgrade your 1.5 forum. Update just to reflect latest version number. 7 new xenforo2 styles released! I am happy to announce that our Xenforo 2 Super Pack Gaming styles are now 24 styles in total. New 2018 styles added are AlBukhory, AlHakim and AlHatim. Meanwhile converted styles are Ziqrien, Ziqrien Green, Ziqrien Orange and Ziqrien Purple. All my vb5 styles (Both Pro Pack and Super Pack) updated again with some more icon fixes. Our vb4 Responsive style pack has been updated. I am sorry for late update. I am glad to announce the release of the update for ST vb5 Pro Pack which consist 4 flat themes with various colors and few extra themes. Next update will be Gaming Super Pack. I have reduced the price for a month. And I have fixed the youtube video being too large in desktop. I have updated the Aventarius for vb5 to fix the broken footer design in lower screen. You have to re-upload the style xml and the style folder as in readme.txt instructions. I am proud to release 3 new vb5 themes. 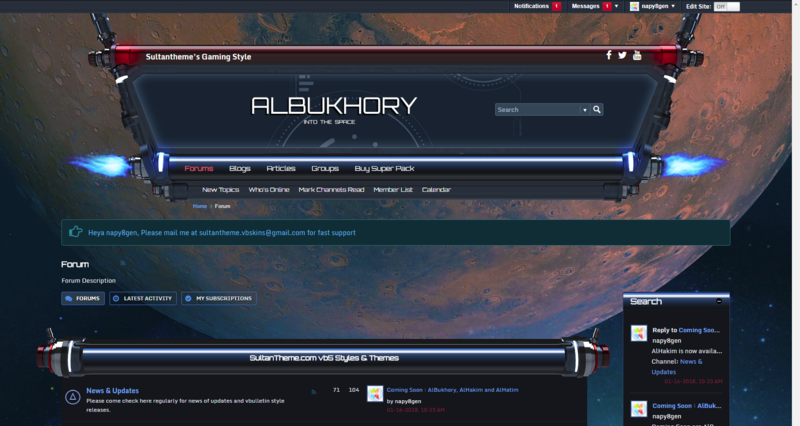 This release brings sultantheme up to the new level. I named them after my sons. All 3 themes have been added to Super Pack. 1) Aventarius,Ardarine,Bad Dragon/blue,Bad Dragon2 – background not full. I am glad to announce 7 new additions to our xenforo2 section before new year.